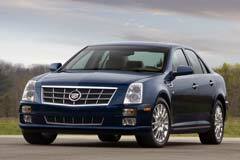 When shopping for a used Cadillac STS the model years you should focus on will be from 2005 to 2011. In 2008 the STS underwent a slight change involving exterior styling, interior amenities and a new power train. Prior to 2008, most used Cadillac STS came equipped with a 3.6 liter V6 255 horsepower engine and 5 speed automatic transmissions. Beginning in 2008, this was replaced by a V6 capable of 302 horsepower and a 6 speed automatic transmission. Except for 2011, an optional upgrade to a 4.6L V8 was also available. Up until 2010 the engine type also determined the trim level. The V8 came standard with automatic wipers, a heated steering wheel as well as heated front and rear seats with a driver’s seat memory function. These features were all optional on the V6 version. Beginning in 2010 the V6 was offered in Luxury Sport, Luxury and Premium models with the V8 available in either Luxury or Performance editions. A used Cadillac STS affords its buyer value and comfort in a luxury sedan. The vehicle is both roomy and powerful with solid performance and handling along with a spacious interior.